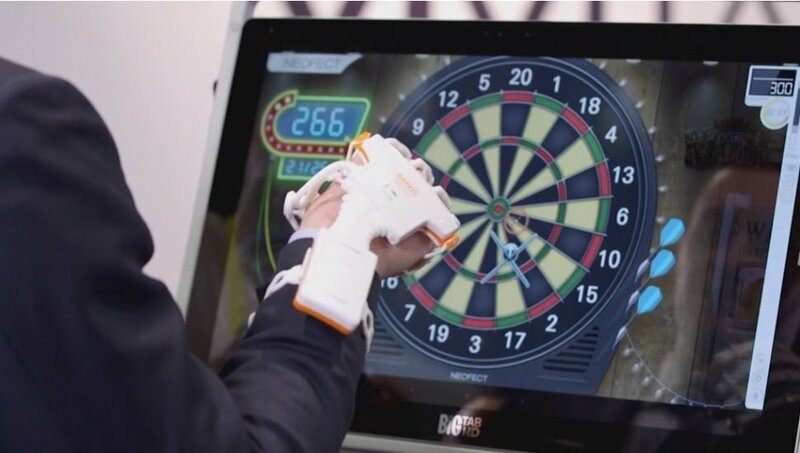 LAS VEGAS (CNNMoney) — After his father and two uncles suffered strokes, Hoyoung Ban decided to develop a device to help people regain control of their hands. Called the Rapael Smart Glove from Neofect, the white glove wraps around a patient’s hand and has movement and position sensors on the fingers and wrists. An Android app that connects via Bluetooth takes users through games and activities that strengthen the muscles in the hands and arms. Hospitals and rehab centers in Europe, Asia and the U.S. already use the glove to treat patients. At CES 2017, Neofect is launching Rapael for patients outside clinics. For $99 a month, people can rent the FDA-approved smart glove and companion Android tablet to rehab hands and wrists at home. After suffering strokes or traumatic brain injuries, people can lose control of limbs or other muscles in the body. About 795,000 people in the U.S. have a stroke each year, according to the CDC, and they can cause long-term disabilities. Some stroke patients lose full muscle mobility — the Rapael glove only benefits patients who have at least some movement in their hands. “I saw the rehabilitation process, and it was very painful for the patient and our family,” Ban said. He began working on the device in 2010, and started selling it to clinics in 2014. Recovery time after a stroke varies. Patients may only need to rent the glove for a few months, or they could require more support. The glove takes patients through forearm, wrist, and finger motions — playing cards, pouring wine and tossing baseballs. The app tracks the playtime, progress and success rate so doctors and patients can see how mobility is improving. Ban told CNNMoney his company is creating a glove for pediatric patients with smaller hands, too. The idea of gamifying rehabilitation could eventually be applied to other injuries or loss of movement, he said. The company will make their app available for Android users to practice moving their hands, but the real benefit is in tracking patients’ progress as they use the device.